If you’ve ever spent time relaxing with a canine companion, petting them and basking in their simple, uncomplicated love, you’ve likely noticed how calming these couch sessions can be. And while research regarding the benefits of having a pet is often aimed at adults, a new study in Preventing Chronic Disease concluded that having a pet dog may lower children’s anxiety levels. The study, which tracked 643 children between the ages of four and ten over the course of a year and a half, found that children with a pet dog at home were significantly less likely to test positive for clinical anxiety (12% versus 21% for children without a dog). According to the study, which relied on a parent’s responses to a questionnaire, having a pet helped in several ways with regard to anxiety, including lessening separation anxiety and social anxiety. Although the research team confirmed that further study was needed to determine whether the relationship between having a dog and lowered anxiety levels is causal, dogs have rightfully earned their moniker of man’s best friend in previous studies by helping to lower the stress hormone cortisol in humans after cuddling and play sessions, by helping patients achieve a variety of mental and physical health goals as part of Animal Assisted Therapy programs, and by acting as a lovable and approachable conversation starter. Another recent study linked having a dog with lowered rates of asthma in children. So basically, you now have even less of an excuse than ever to visit your local Humane Society or animal shelter to pick up a cuddly, lovable furry friend. The health of your whole family could potentially benefit! Just remember, adding a pet to your pack is a lifelong commitment that should not be taken lightly. Read our guide: 8 Questions to Ask Before Adopting a Dog. If you've ever spent time relaxing with a canine companion, petting them and basking in their simple, uncomplicated love, you've likely noticed how calming these couch sessions can be. And while research regarding the benefits of having a pet is often aimed at adults, a�new study in Preventing Chronic Disease concluded that having a pet dog may lower children's anxiety levels. The study, which tracked 643 children between the ages of four and ten over the course of a year and a half, found that children with a pet dog at home were significantly less likely to test positive for clinical anxiety (12% versus 21% for children without a dog). According to the study, which relied on a parent's responses to a questionnaire, having a pet helped in several ways with regard to anxiety, including lessening separation anxiety and social anxiety. Although the research team confirmed that further study was needed to determine whether the relationship between having a dog and lowered anxiety levels is causal, dogs have rightfully earned their moniker of man's best friend in previous studies by helping to lower the stress hormone cortisol in humans after cuddling and play sessions, by helping patients achieve�a variety of mental and physical health goals as part of Animal Assisted Therapy programs, and by acting as a lovable and approachable conversation starter. 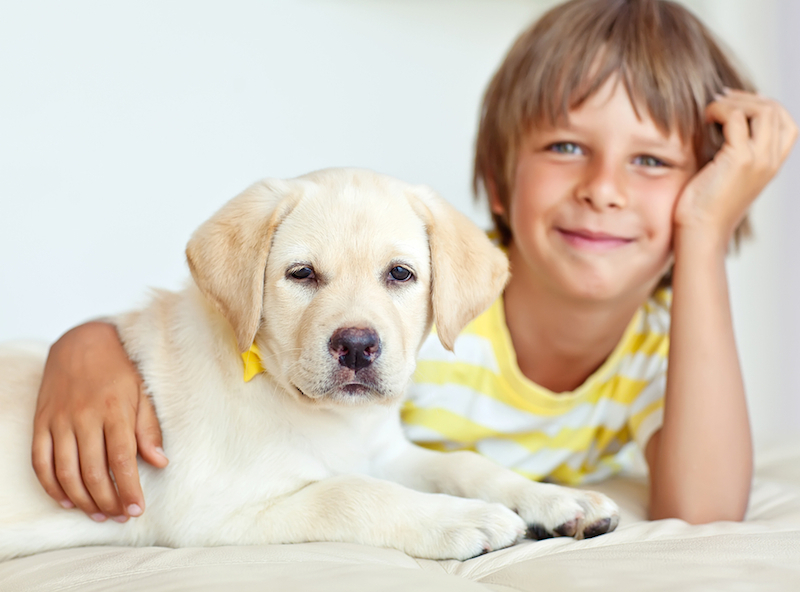 Another recent study linked having a dog with lowered rates of asthma in children. So basically, you now have even less of an excuse than ever to visit your local Humane Society or animal shelter to pick up a cuddly, lovable furry friend. The health of your whole family could potentially benefit! Just remember, adding a pet to your pack is a lifelong commitment that should not be taken lightly. Read our guide: 8 Questions to Ask Before Adopting a Dog.